After the housing market bust we experienced across the country in 2008, many experts have been quick to warn that a new bubble may be forming in some areas of the country. 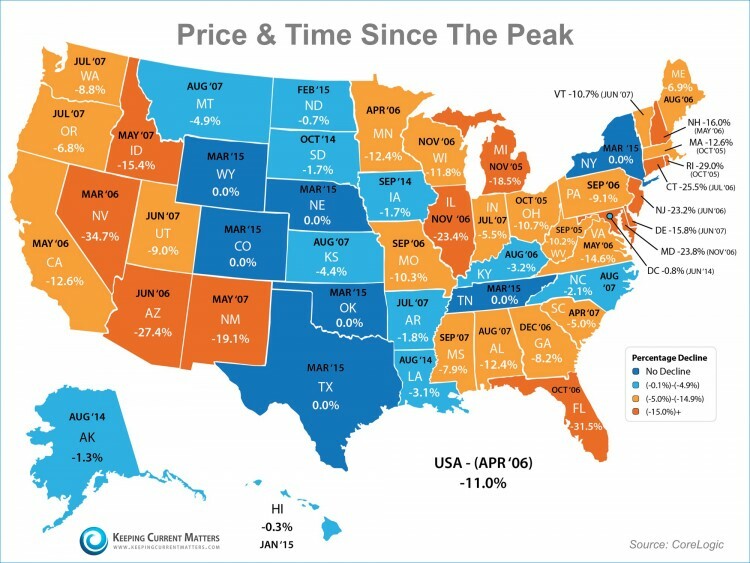 The quickest and easiest way to show how far we’ve come and how far we still need to go in regards to the ‘Peak’ is to share CoreLogic’s Price & Time Since Peak figures, used to create the map below. Many areas of the country still have a long way to go to be anywhere near the peaks experienced in 2005-2007. Seven states (seen in the darker blue) are currently at their peak. In Georgia, we are still down -8.2% from the peak. The biggest challenge facing the housing market’s recovery right now is the lack of inventory available for sale. Prices are determined by supply and demand. Right now buyer demand is out-pacing seller supply, across many price ranges, driving prices up. If you are a homeowner debating listing your home for sale this spring/summer, now is the time, let’s get together to discuss your options. Stay on top of your Local Market by visiting our Local Market Guides.